Mini quad without pedals. Got inspired by this bicycle as it is standing in one of our spare rooms where my +1 year old niece sleeps every now and then. I noticed how much fun she has with this toy as she was speeding through our house. I might give her this image as a present later as a big print on her wall, that should really look cool! 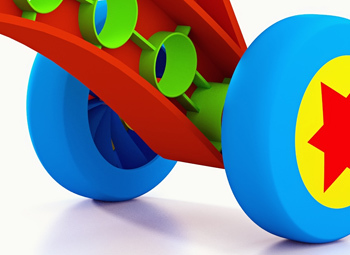 Made this four wheel bicycle image as a 3D model and rendered it. Detail of four wheeled kids bike. Four wheeled kids toy bike.